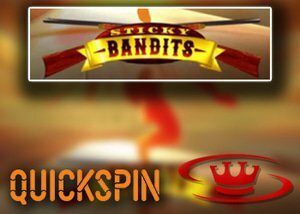 Get your hands on a Quickspin free spins bonus to test out the brand new Sticky Bandit slot this June. Quickspin is known for releasing great video slot machines and the new Sticky Bandit slot is no exception. Following on from the successful release of Sakura Fortune, Quickspin is releasing Sticky Bandit with its Far West inspired theme. This new video slot will hit all Quickspin casino on the 20th of June and we can't wait to try it out. Although the game hasn't been released to casinos yet, Quickspin have released a sneak preview video of the game and it looks great. This slot will be available on desktop, tablet, and mobile and features cowboys and sheriffs. It comes with two wild symbols that can take over 2 entire reels. Both Wilds also work as scatters and can substitute for all other symbols in the game to increase winning combinations. There is a free spins feature that will award players with 7 free spins and wilds are included too which become sticky. The game looks stunning and there are plenty of big wins to be had. You can view the video preview at the end of this section and if you want to spin the reels when it releases, be sure to check out the excellent Quickspin free spins bonus we have detailed below. Our special Quickspin free spins bonus comes from Sin Spins casino. This is an excellent online casino that is available for all users including mobile gamers. They offer over 400 top casino games and a fantastic 25 free spins bonus. We highly recommend registering for a real money player today and testing out all the great games they offer. The Sin Spins casino bonus for real money players is a 100% match deposit bonus up to $200 plus 25 free spins on a specific slot. The chosen slot changes all the time, but right now it is for NetEnt's Starburst. There are wagering requirements that are set at 50x and the free spins offer is available for 7 days after you make your first deposit. The rewards don't stop with your first deposit either, there are plenty of great promotions for regular players to avail of. This includes special weekly promotions where players receive bonuses, cashback, and more. Take part in the Global Adventure promo and you get free spins on a new game every single free. The slots games are listed on the promotion page and you can claim each bonus twice. Other promotions include Jungle Spirit, Roulette Promo with up to 25% cashback, Happy Hour, Live Dealer Cashback up to 30%, Weekly Surprise deals, and so much more. Sign up today and be ready to play the new Sticky Bandit slot when it releases on the 20th of June.